After living in Japan, the land were not all cafés serve coffee, and Dotour has a 30-minute time limit in Tokyo, I assumed that in Seoul it would be just as difficult to find a chill place serving great lattes with the ability to drink them in front of a laptop for two hours. After having great success in Kyoto as the result of extensive café research, I attempted to do some café planning for Seoul, but the internet disappointed me in its dearth of information. It seemed that they were no particularly interesting cafes in Seoul, and the ones I found were miles apart from one another. I resigned myself to a café-less trip. And found cafes on every street corner. In almost every neighborhood, there are plenty of chain cafes to be found, both local and Western companies. Starbucks, Coffee Bean & Tea Leaf, and Holly’s were among the most omnipresent. But there were plenty of local places like Mango Six, Coffeesmith, Twosomes, DeLambre, Beansbins, and Café Breeze were among those I remember, but there were dozens more. In the short time I was there, I even found my default place: a quiet sanctuary amidst the bustle of Hondae called The Mayflower Café. Café by day and bar by night, this place boasts two levels of food, beer, wine, and coffee, in addition to a gorgeous sprawling outdoor patio. 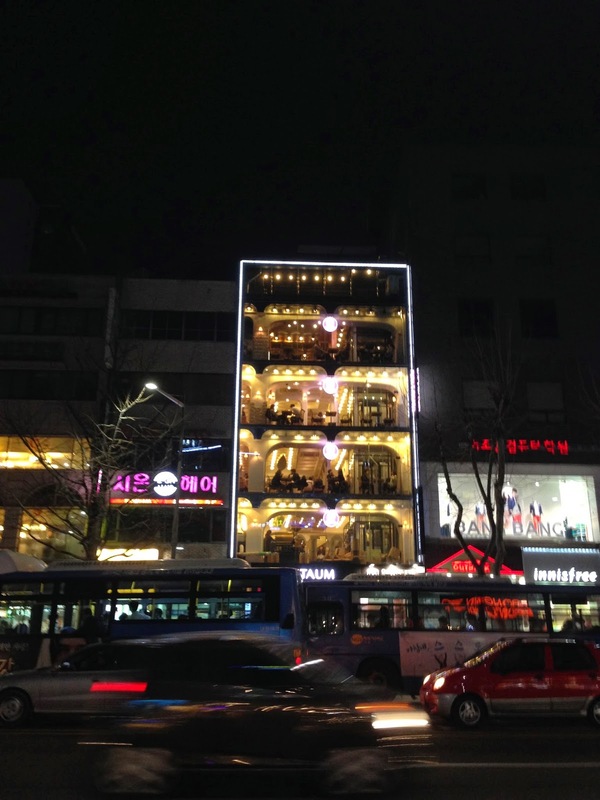 There was something else I noticed about he cafes in Seoul. They were far more coffee-centered than the cafes in Japan. Seoul’s cafes had extensive coffee menus, and most didn’t serve food, in stark contrast to cafes in Japan, which are all more food-centered and tend to expect you to order a food item. 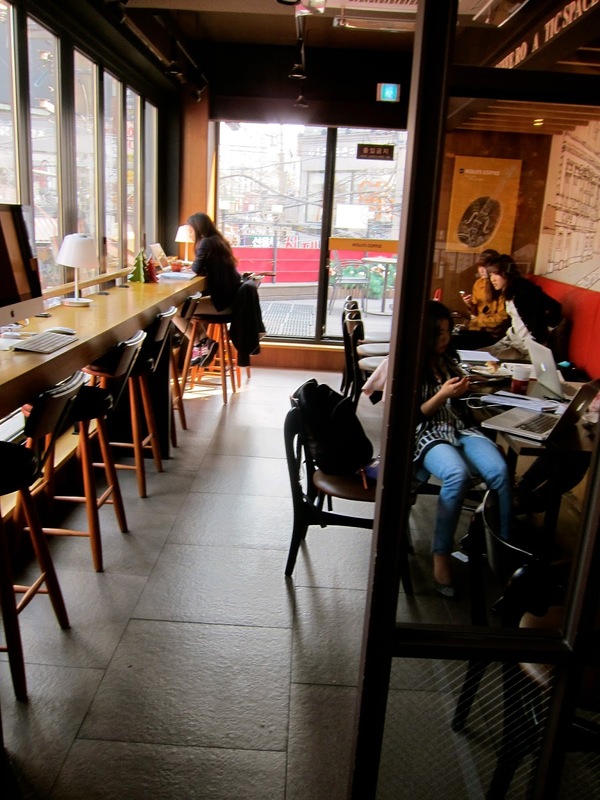 The cafes in Seoul seemed to replicate the laid-back atmosphere of Starbucks, allowing you to order a drink at the counter, sit wherever you like, and stay as long as you like. I noticed many people on their laptops, and some even sitting at a table with no drink, meaning that they either finished their drink long ago or never even ordered one. This is very different from Japan, where most cafes will seat you, have you a menu, and you will have to order through a waiter or waitress. In Japan, there usually isn’t a time limit (except at some cafes in Tokyo), but it just feels rude to linger for too long. In Japan, most cafes are generally populated by singles and pairs of people. Occasionally you will see a group of three or four, but I’ve almost never seen more than that. 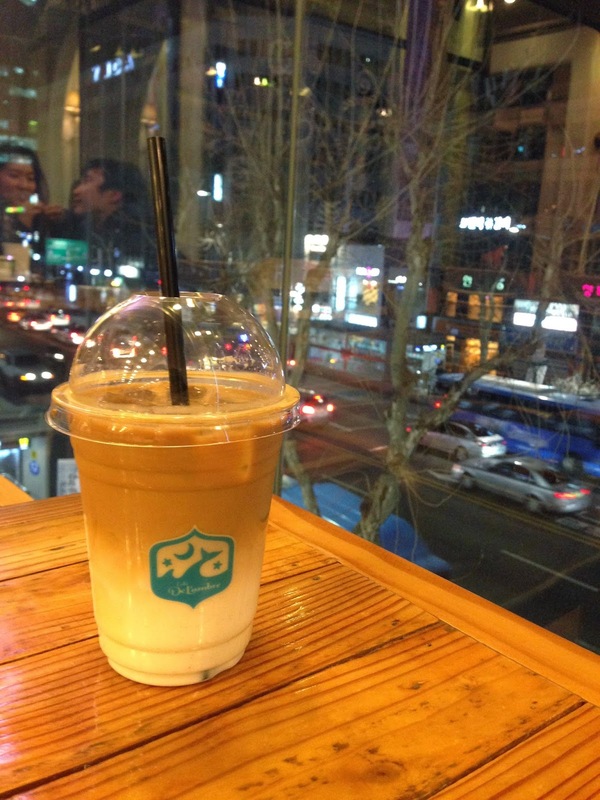 In Seoul there were plenty of pairs and a lot of singles, but large croups dominated the café scene. Whether it was gangs of fashionable women taking selfies, or groups of college students studying, tables and chairs were pushed together to make long banquet tables for these huge groups. In Japan, cafes tend to me quiet places. So quiet that I can distinguish which Chopin Waltz in playing from overheard. In Seoul, the only background serenade is the sound of chatting voices. Seoul is loud and lively. Even on the trains, planes, and streets people are constantly talking and making noise. This is so different from Japan, where people are generally silent or speak at softer volumes. Every time I entered a café in Seoul I felt like I had walked into a bar at peak our. Coffee is not considered a “morning thing” in Seoul. Cafes are open until 11:00 pm or later to accommodate the night shoppers and pre-clubbers. Whereas in Japan I have come to learn the peak hours for café rushes, Seoul’s cafes seemed to be consistently busy throughout the day and night. Based on this analysis, it seems that Seoul is the place to be. Now I know why I couldn’t find any café guides on the internet, or café books in the store. There are simply too many wonderful options for anyone to have a need to list or categorize them. There is no need to pre-plot them on a map before you go. Just show up and there will be one on every corner.